Microsoft will begin inviting users to test the new iOS and Android apps of Skype for Business, the enterprise communications software whose latest version was launched a few months ago. The preview will include a number of benefits including a redesigned in-call experience. The new call screen features larger buttons to make it easier to manage a call on a phone's smaller screen. The app's new dashboard is designed to make communication easier by pulling a user's most recent conversations, upcoming meetings and the ability to search all their contacts into one place. Video calls will now fill the screen on a user's phone, so it's easier for them to see their colleagues. Furthermore, the new app's design is supposed to simplify the video, content and IM panes and make navigating between them easier. Getting access to the preview apps will be a somewhat involved process. IT administrators can visit skypepreview.com and nominate up to four end users each to test out the iOS and Android apps. Administrators have to apply by Friday to be considered for the first testing batch. After that, Microsoft will evaluate the nominations and pick out a group of testers for the applications. 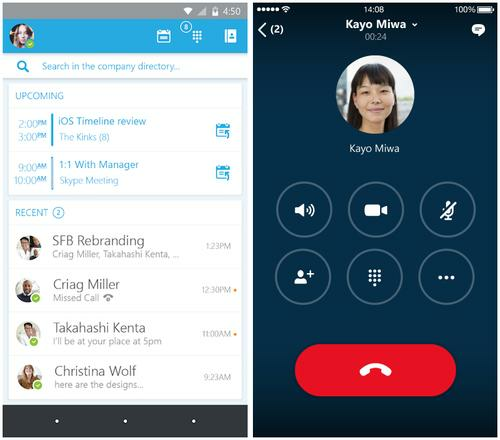 Users who have the Lync 2013 app for iOS or Android will get automatically upgraded to Skype for Business when the app launches later this year. It's compatible with deployments of Lync Server 2013, Skype for Business Server 2015 and Skype for Business Online. Skype for Business was officially released in April for Windows PCs, but Microsoft has been slower to update and rebrand other platforms. Windows Phone owners already have access to a new Skype for Business app, which launched last month. The product's iOS and Android apps are slated to ship later this year.